Shoma spent her early years in Bandra in what was then Bombay. The 1970’s were a turbulent period. At that time, almost everyone had sympathies with the Left. While in college, she was with the Vidyarthi Pragati Sanghatana (VPS) and she edited Kalam, the student magazine. She was involved in supporting the workers during the textile strike in Mumbai of the 1980’s. During this time, Shoma became a lecturer in Mumbai and a part of Committee for the Protection of Democratic Rights (CPDR), and helping bring out the CPDR magazine, Adhikar Raksha. Shoma moved from Bombay to Nagpur, where her daughter Koel was born. Shoma spent the next few decades of her life living in Nagpur with her partner and daughter, teaching in colleges and working to build a democratic movement that recognises and fights for the rights of the most marginalised and vulnerable sections of society. Shoma and Koel stood by her partner throughout the difficult times that he was arrested and released between 2007 and 2017. Shoma’s home has always been a refuge for women struggling to survive and make ends meet; she has done everything in her power to help them fight an unjust system. She is an active member of the national collective, Women Against Sexual Violence and State Repression (WSS). She was an early member of the Nagpur-based Stree Chetna. She later became the founder convener of the Committee against Violence on Women (CAVOW) and edited its magazine, Stree Garjana. The organisation took part in fact finding visits to examine the implementation of the Armed Forces Special Powers Act (AFSPA) in Manipur after Thangjam Manorama’s brutal killing in 2004 and the allegations of sexual violence by the Salwa Judum in South Bastar in Chhattisgarh. CAVOW also played a role in organising legal aid for many women political prisoners during the early 2000s. Shoma also convened an adivasi mahila sammelan at Ranchi in March 2006. She has been a long-time Dalit and women’s rights activist, advocating for the rights of the marginalised and powerless. In an essay titled ‘The Village and the City: Dalit Feminisms in the Autobiographies of Baby Kamble and Urmila Pawar’, she looks at the ways in which mainstream feminism has tended to ignore the problems of caste, resulting in a distinct Dalit feminism that acknowledges patriarchal oppression from outside and within communities. In 2011, she was a part of Indian Association of Women’s Studies (IAWS) national conference in Wardha. In recent years, Shoma has been involved with Committee for the Protection of Democratic Rights (CPDR) in Nagpur. She has been helping voices of resistance be heard, voices that are being silenced everywhere in the current socio-political climate. Shoma got involved with the Women’s Studies department at Wardha’s Hindi Vishwavidyalaya, and being fluent in Hindi, often helped cover the shortage of teachers and examiners. She taught in ad hoc positions in several colleges, like the People’s Welfare Society (PWS) College in Indora, Nagpur, leaving home (and her then young daughter) early in the morning to get to work. After college hours, she would visit women (many of them Dalits and victims of domestic violence) in the slums and ghettos of Nagpur to discuss their issues and concerns. 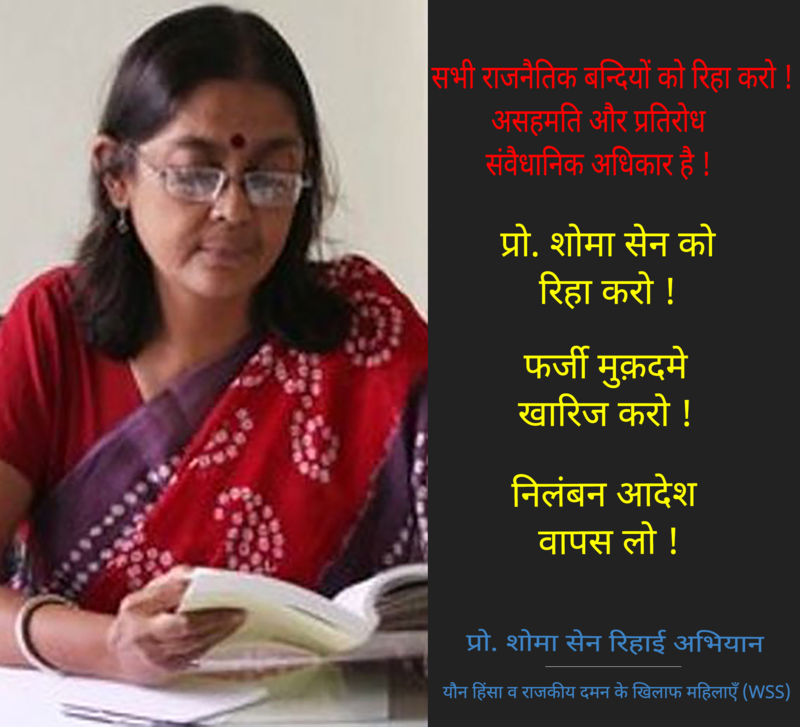 She joined Rashtrasant Tukadoji Maharaj Nagpur University, heading its English department. As a teacher, she was appreciated by both students and seniors. Promoted as Head of Department and respected for her intellect, Shoma has been an active scholar in the fields of post-colonialism and women’s studies for several decades. Her articles have appeared in scholarly publications such as the Economic and Political Weekly (EPW) and The Journal of Commonwealth Literature. She is a valued member of the University community and an important voice in the struggle to uphold human rights. She has travelled to deliver lectures and talks and is a popular teacher, with a passionate interest in reading, researching and teaching literature and women’s studies. Shoma is due to retire in July 2018 after more than three decades of exemplary service. Today, after all these years, her friends and colleagues are in shock at this brazen display of force by the police on her and the other four arrested, and wonder if this is the fate that awaits all those who speak out against poverty, inequalities and injustice. Now, days before she was scheduled to retire in June 2018, the university, where she spent so many years of her professional life, suspended her for being detained by the police under various sections of the Indian Penal Code (IPC). Shoma was arrested in pre-dawn raids conducted simultaneously across four cities along with four others. They were Surendra Gadling, a respected lawyer who fought multiple pro bono cases for adivasis, dalits and political prisoners and General Secretary, Indian Association of Peoples’ Lawyers (IAPL); Sudhir Dhawale, founder, Republican Panthers Jaatiya Antachi Chalwal (Republican Panthers Caste Annihilation Movement) and editor, Vidrohi magazine; Rona Wilson, public relations secretary of Committee for the Release of Political Prisoners (CRPP) and Mahesh Raut, anti-displacement activist and former Prime Minister Rural Development Fellow (PMRDF). All those arrested have at various times spoken against the brutalities committed by state forces and the police against its citizens and have fought for the release of political prisoners. These arrests come in the wake of the assertion of dalit, adivasi, OBC and Muslim unity during the Bhima Koregaon Shaurya Din Prerna Abhiyan organised by the ‘Elgaar Parishad’ in Pune on December 31, 2017, and the attack by right wing organisations following the extraordinary unity among the communities. Shoma has been charged under various stringent sections of the Unlawful Activities (Prevention) Act (UAPA), and has been accused of, among other things, inciting the violence in January 2018 through speeches; of doing so on behalf of the banned CPI (Maoist); of having links with and harbouring fugitive members of this party at various times; and of fundraising for them. By charging her with extraordinary number of sections of the IPC and UAPA, the police want to project her as a “dreaded criminal” and this legal overreach is intended to ensure a prolonged stint in police and judicial custody, irrespective of the validity of the claims. These charges are meant to serve as a life sentence to the arrested by the police, reaffirmed through the media, even if the judicial system finds them innocent in the days to come. Her arrest is part of the State’s ongoing efforts to intimidate and silence people who have been outspoken or critical of its anti-people policies. It is a matter of grave concern that dissenting intellectuals and activists are being targeted in this manner by the state. Most of the media too is playing its role as an “arm” of the government, instead of doing what it is supposed to do, i.e., to conduct independent investigation before publishing its stories and refraining from sensationalism and media trials. After a lifetime of working for others, people like Shoma Sen are branded ‘anti-national’ by the Indian State. Humane and perceptive people who have spent their lives working to recognise, transform and build a more democratic society, are being treated as criminals waging war against ‘national interests’. Here, we must ask, whose interests are being served? Dialogue and dissent is a crucial part of any democratic society. The repression of these voices and vindictive and excessive state action is completely unacceptable in a free democracy. Women against Sexual Violence and State Repression (WSS), a network of women working for a democratic society, against patriarchy, caste discrimination, communalism and bigotry, stands in solidarity with Shoma Sen and all those arrested under these unconscionable conditions and demands their immediate and unconditional release.